Litten in game: 7,978 Who? Important notice! 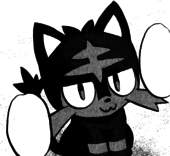 Pokemon Litten is a fictional character of humans. Litten (Japanese: ?? ?— Nyabby) is a Fire-type Pokémon introduced in Generation VII. Along with Rowlet and Popplio, Litten is one of three starter Pokémon of Alola available at the beginning of Pokémon Sun and Moon. 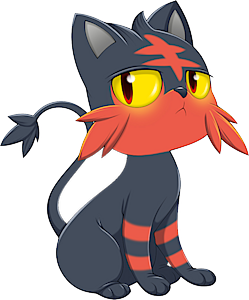 Litten is a quadruped, feline Pokémon covered with primarily black fur. It has a short muzzle with a tiny, black nose, red eyes with yellow sclera, and short, pointed ears with pale gray insides. There are two red stripes around each of its legs and two horizontal stripes with a vertical stripe across them on its forehead. 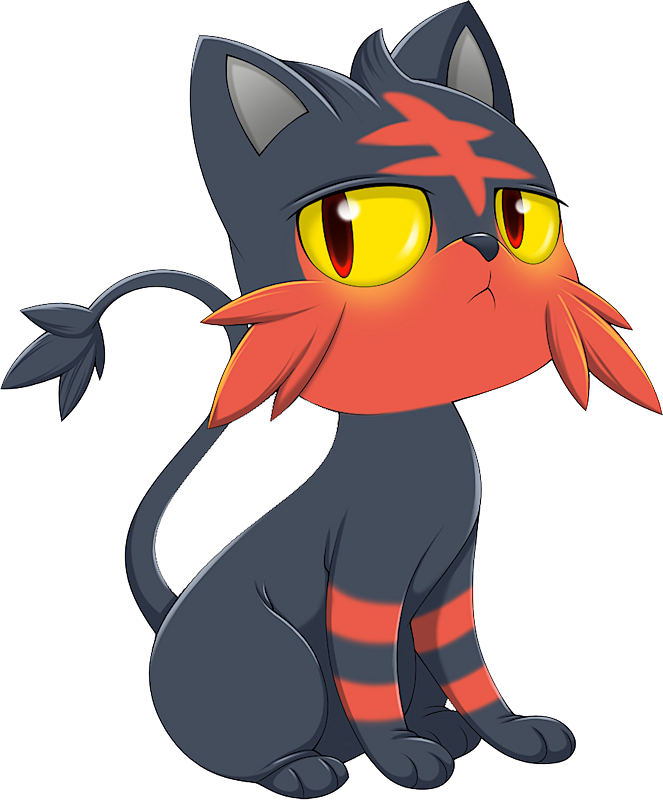 The lower part of Litten's face is also red, and there is a large tuft of fur on each cheek. A tuft of fur sits at the end of its long tail. When it arches its back, three pointed tufts of fur with red tips appear along its spine. Litten is a solitary Pokémon that does not typically display its emotions. While grooming, it collects fur inside its stomach. By setting the stored fur alight, it can spit fireballs that change based on how it coughs. Litten's fur produces flammable oils, and when it begins shedding, it burns all its fur in a blaze. A wild Litten living on Melemele Island first appeared in Alola to New Adventure!. Sun's Litten, nicknamed En, appeared in the Sun & Moon chapter, where he was used to dry Moon's wet clothes. 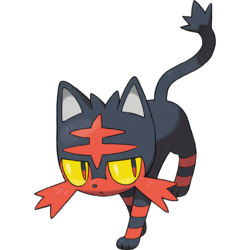 Litten is based on a young feline, specifically a tabby cat due to the bands/stripes on its legs and the marking on its forehead. Nyabby may be a combination of ? ?— nya (meow), tabby, and ? hi (fire).